The lenticular filter cartridge format was invented by Alsop Engineering in the 1940s. Today, ErtelAlsop continuously improves upon this innovation. With its totally enclosed design, it is the perfect alternative to the plate and frame filter press. Since Pak Filter cartridges are comprised of the same filter media used in plate and frame filtration, existing process specifications can easily be translated from plate and frame to lenticular filter cartridge format. This provides a totally enclosed, operator friendly depth filtration system. ThePak cartridge design also allows for quick change out times, so down time is minimal as compared to other means of filtration. Filter Housings are available in vertical or horizontal mountings, and for industrial use or fine filtration. 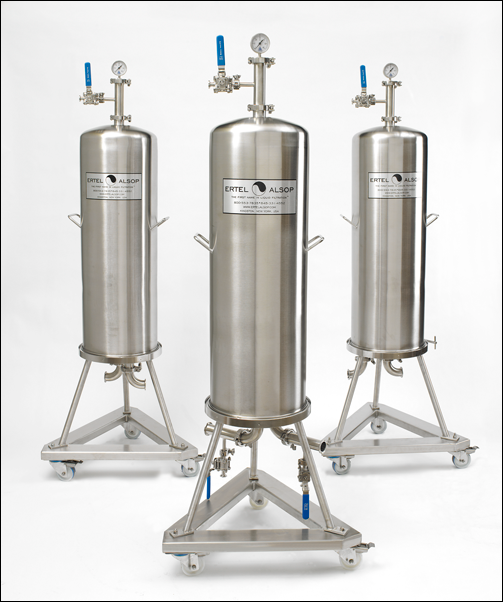 Our Filter Housings are 12″ or 16″ in diameter, and include designs for flat gasket or double-O-ring cartridges. In applications throughout the pharmaceutical, chemical, cosmetic, food & beverage and electric utility industries, ErtelAlsop can provide the best Pak filter housings to suit your needs. For industrial applications, we offer a top loading design, in which filter housings can be loaded and reloaded with Paks by a single operator. The sanitary design, is equipped with a domed cylinder, which is easily removed and can be offered in sections to eliminate the need for an overhead hoist. Domed Filter Housing – Polished, stainless steel Double O-Ring housing. Sanitary Pak Housing – Sanitary, Double O-Ring housing for pharmaceutical applications. Industrial Flat Top Housing – Large volume plate and frame filter presses. Horizontal Flanged Housing – Easy one person operation from loading to unloading. Electric Utility Housing – Designed for use in the electric utility industry .. The fully enclosed design of the Pak® filter helps to minimize exposure to the product stream in both liquid and vapor form. Each Pak® can hold up to 3.42 square meters (36 square feet) of filtration area, and one housing can hold up to 13.7 square meters with only four 16-inch diameter Pak® elements. Once the housing is drained, the top can be removed, followed by the Pak® cartridges. New Pak® elements are installed and the dome is replaced. The unit is prepared for the next batch, or continuation of the existing run. Skid Mountings Multiple housings can be mounted on a single base to allow for greater flow or extended throughput. The skids can be stationary or portable.